In Perfect Scoundrels (Disney/Hyperion 2013) by Ally Carter, teenage master thief, Kat Bishop, is left hanging (literally. There’s a zip line involved) in the middle of a job in Argentina when her boyfriend, billionaire W.W. Hale V, gets a call that changes everything. His beloved grandmother — the only family member who ever really understood him — has died and surprisingly left the whole Hale empire to him. Soon Hale is acting cold and distant and is sucked back into the world he was so desperate to run away from. Kat’s not sure how to help him, especially when she learns that his grandmother’s will might have been forged in a nefarious scheme to steal the Hale family fortune. To figure out what’s going on and stop the possible thief, Kat gathers her “family” (Gabrielle, Simon, the Bagshaws, Nick, Uncle Eddie, her dad, and more) to help save Hale’s. However, by saving her boyfriend’s company she could lose him to that fancy-pants world forever. It’s quite the dilemma. I believe I’ve mentioned my love of stories about spies and thieves before. In fact, one might say that I’ve discussed it incessantly. It should be no surprise then that Ally Carter is one of my favorite YA authors. I mean she has one series about teenaged spies and another series about teenaged thieves. What’s not to love? 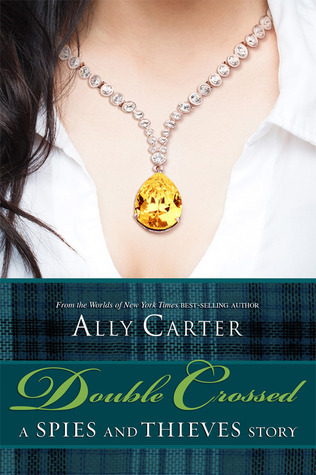 Now in anticipation of new books coming out in BOTH series in 2013, Ally Carter has put out the holy grail for obsessive fans like me: a crossover story. And the best part is that it’s free! Double Crossed (Disney/Hyperion 2013) finds Gallagher Girl Macey McHenry and Heist Society’s W.W. Hale V meeting up at a fancy society charity gala. Both were born into immense privilege and both can tell that the other has more going on beneath the surface. So naturally when a group of thieves crash the party and hold everyone hostage, Macey and Hale have to team up to save the day, with a little outside help from master thief Kat Bishop and super-agent Aunt Abby. Yay! The plot is kind of beside the point here. I mean all I really ask in a crossover story is that there be a legitimate reason for the characters to cross paths. And of all the characters from both series, Macey (who is my favorite Gallagher Girl, by the way) and Hale make the most sense. Not only were they both born into that uber-rich world, but they both use that world to hide their true badass selves. There are lots of fun “why is that billionaire boy pick-pocketing the mayor (because he can)” and “why does that socialite know Albanian (because it was for extra credit) kind of moments. The heist plot makes enough sense and it’s satisfying when they inevitably take the bad guys down. Double Crossed is a treat for the fans. Not to get too greedy, but it made me want a whole bunch of stand-alone crossover novels, like those Nancy Drew/Hardy Boys specials from when I was a kid. You don’t need to have read the previous books to understand the story though. 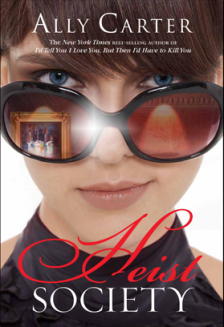 And since it also contains the first three chapters of Heist Society and I’d Tell You I Love You, But Then I’d Have to Kill You, it’s a good way for readers to sample Ally Carter’s world. The story is only available electronically, but you can read it at SpiesAndThieves.com if you do not have an e-reader. And only a few more weeks until the next book! Let’s go steal a cursed emerald! This book is really fun. If you like fun, then you should read it. I love heist stories. LOVE them. Seriously, you give me a heist plot that at least kind of makes sense, and chances are, I will enjoy it. Give me a heist plot that mostly makes sense (just a few tiny quibbles) and also has humor and extremely likable characters, and I will clap my hands with glee. Riding high from her triumph in Heist Society, Kat Bishop has gotten a little cocky. In her quest to steal back priceless objects of art originally taken by Nazis and other really bad men, she’s started doing risky jobs all by herself, much to the chagrin of her friends and family. So when an old women approaches Kat and asks her to steal back the elusive, and supposedly cursed, Cleopatra Emerald that was originally stolen from her family, Kat can’t resist. Even if it means going against the wishes of Uncle Eddie, the fearsome family patriarch. Mistakes are made, secrets are revealed, and shenanigans do ensue. I love a good shenanigan. What? What the hell does a donkey have to do anything? (p.s. Thanks for the tip.) And the book is littered with off-hand references to different cons and past jobs and I want to know about every single one of them right now! But these things never get fully explained because 1) the characters all live in that criminal world and therefore don’t need to over-explain things to each other and 2) it forces us to use our (gasp) imaginations. This also extends to the romantic subplot between Kat and Hale. There are lots of scorching looks and instances of palpable romantic tension, but the characters don’t spend an endless amount of time discussing their feelings, and I for one am grateful. And lastly, the unsung hero of this series is the book designer. The covers have a great Audrey Hepburn Breakfast at Tiffany’s/How to Steal a Million vibe, and I love how the object that the crew is trying to steal is reflected in the lens of the sunglasses. And you can see the girl’s face! I don’t get as worked up about it as some people, but that’s a rarity these days for YA covers. I also love the map inserts that detail Kat’s location and countdown to the various cons that are sprinkled throughout the story. Not only do the maps help the international master-thief feel, but the timeline helps the reader keep track of the story. Between these books and the Gallagher Girl series, Ally Carter should really send flowers to her designer at Hyperion because he or she is doing a fantastic job. So to all those whiners out there complaining about the darkness in YA, here’s the fun, joyful adventure you’ve been looking for! And reading this book just might inspire you to go watch Ocean’s Eleven again. This is never a bad thing.